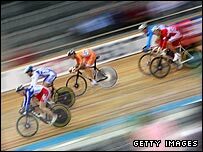 The men's omnium race is the pentathlon of cycling, reintroduced into the track cycling world championships in 2007. Each competitor rides in five events - 200m flying time trial, 5km scratch race, 3km individual pursuit, 15km points race and 1km time trial - all of which must be completed. Points are awarded in reverse order, with the winning rider of each event getting one point, and the rider with the lowest number of points overall is the winner. If there two or more riders are level on points after all five events, the best times from the time trials determine who wins. To win the omnium, you've got to be good at sprinting, time-trialling and bunched racing.